Sweet Peas and Polka Dots! Hi there! Emily Midgett here with you today sharing a pretty in pink card with lots of texture and color. It finally feels like spring here in the Midwest, so I thought I’d celebrate with some pretty pink flowers! Let’s get started with the details. 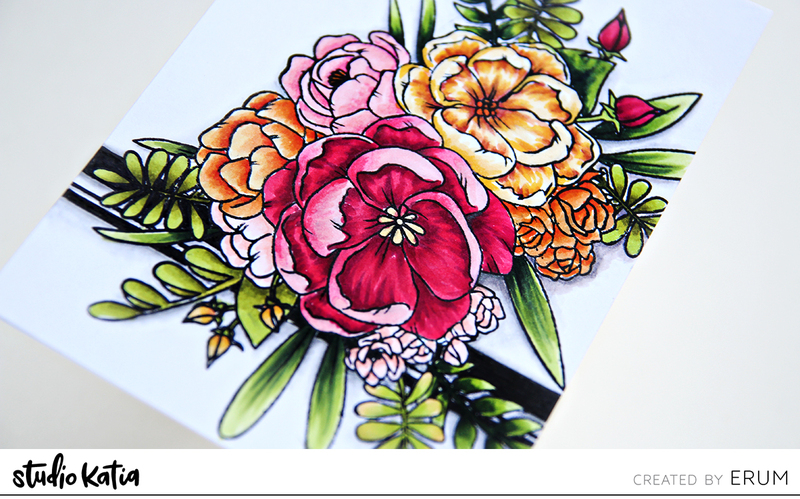 I began by stamping and die cutting the blooms from You’re So Sweet using Copic-friendly black ink onto some white card stock, then colored it with my Copic markers and die cut them. On the white A2 card base, I used the Large Polka Stencil and some pretty pink ink to add a bit of pattern on the background. I die cut a vellum oval using the Nested Ovals dies, as well as a black Thank You die cut using the Mini Thank You dies. I arranged the flowers over the oval, then adhered them to the oval and added some foam adhesive behind them, hiding the adhesive behind the die cuts. After I’d added all of the die cuts to the card front, I added some beautiful Cupid’s Kiss Crystals to add some sparkle, and a bit of Glossy Accents to the die cut sentiment to make it stand out even more. Well, that’s all for me today! I hope you’re having an awesome week. Thanks for stopping by! Hello Everyone! Liliuska here and today I’d have a shaker card to share with you. I made it using gorgeous FLORAL WREATH stamp set. I started with stamping the wreath image with a very light ink, as I wanted to avoid black lines for this card. I coloured the image with coloured pencils and fussy cut it with scissors. I die cut out a panel out of white cardstock using largest die from DARLING RIBBON & FRAMES and ran it through my die cutting machine making with an embossing mat and a BRUSH STROKE WAVES STENCIL to do dry embossing. I like that it added just a little bit of texture to my card and didn’t overwhelm the background, as I wanted to keep the focus on the coloured image. To make a shaker I needed to cut out a window in the wreath image and was pleased to discover that a circle die from DOTTED PATTERNS SET 1 matches perfectly! Next, I used Studio Katia GLUE to adhere acetate to the back of the wreath image. I have been using it for shakers lately and love how well it adheres acetate to the paper. I filled the shaker with GOLD FOIL CONFETTI and GOLD CRYSTALS. I used GOLD FOIL CONFETTI to embellished my card a little as well. All I needed now was a sentiment. I die cut it out of white and gold glitter cardstock and glued together a little off so that the white was visible under the gold and would give the word thanks a little bit of a shadow. I adhered the sentiment on top of the shaker window using Studio Katia GLUE, it is my favourite liquid glue! Hope you enjoyed my card today. Have a wonderful weekend! Hi there! Emily Midgett back with you today to share a project combining some old and some new products from the Studio Katia lineup. Now, if you’ve ever visited my blog, you’ll notice something…. flowers and coloring are my jam. I can’t get enough of pretty blooms (which Studio Katia luckily has in spades), nor can I get enough of numerous coloring mediums. I am fortunate to own many different watercoloring mediums, including the Ph Martins Liquid Watercolors, which I’ve used on today’s project. I painted this peony during the latest Daily Marker 30 Day Challenge, and couldn’t wait to use it on a project! Let’s get started with the details. I began by stamping and clear embossing the main peony image from Japanese Peony onto some Arches cold press watercolor paper. I then used my Ph Martins liquid watercolors to add shades of coral, pink, and fuchsia purple to the peony, first by wetting the peony completely with clean water, then dropping in very diluted color for my first “layer” of color. (I am all about layers!) After the first layer had dried, I then went back in with more concentrated watercolor to add shading and shadows. Having that first layer of multiple mottled colors helps to add some variety and uniqueness to the image. Next, I worked on my background. I began by blending two A2 sized panels using bright fuchsia, hot pink, and deep coral inks (trying to match the colors used on the flower itself). I die cut one of the blended panels using the new Grid Cover die, backing it with some acetate and foam tape to create a shaker. I then filled my shaker with Luminous Lavender Flowers, Iridescent Dust Seed Beads, Luminous Lavender Fusion sequins, and adhered it to the other blended panel. After my shaker had been completed, it was time to add the flower and a greeting to the front. I added the Japanese Peony to the bottom of the card front, trimming off some of the foliage that hung over the edge and placing it around the top of the peony (waste not, want not! ), then white embossed a greeting from Cup of Thanks onto some strips of black card stock and added them to the card front using liquid adhesive. Well, that’s all for me today! I hope you enjoyed a bit of summer in my post today…. I’m so enjoying these longer days with more sunlight!! Thanks so much for stopping by, and have a marvelous day! Hello everyone! It’s Galina with you today and I am in a summer mood already! 🙂 So I have a bright pattern on the card. I was inspired by Hawaiian shirts when I was creating this card. Let’s take a look. For this car I combined few stamps from new release. For the sentiment I used die from previous release, I love that font very much. So I started with stamping and coloring bunch of flowers, leaves and surfing boards. I colored all images with Copic markers and I use dark red pencil on flowers to add more details. I made few clusters with those images and adhered them into blue card panel using 3d foam tape. Also I cut a black stripe and die cut a sentiment from glitter cardstock and attached them over the pattern. With white gel pen and light blue copic markers I add accents on my pattern and my card is done! 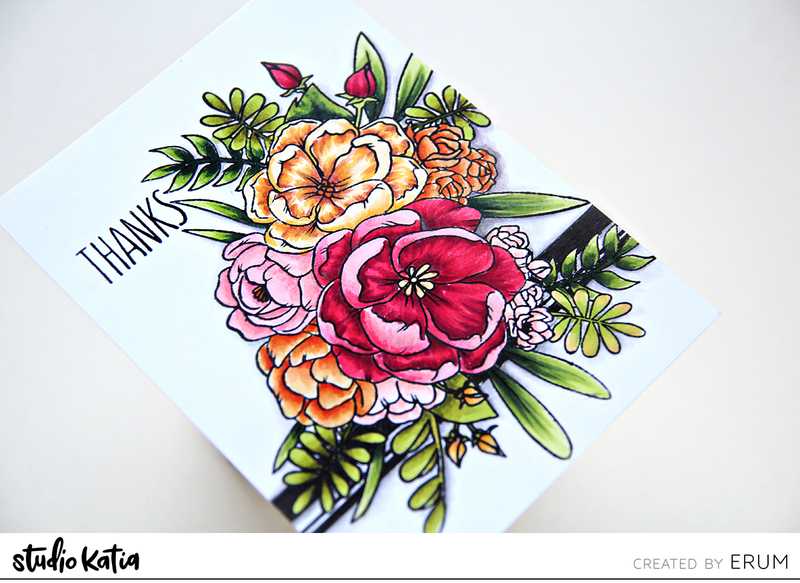 Hey lovelies, Tracy with you today sharing a card I recently created using the A Cup Of Thanks stamp set. I used the sentiment thanks a latte as the mug I use for my latte is actually really similar to this one so it seemed kinda fitting. I started off stamping the image into some Neenah Solar white cardstock and then coloring it with Spectrum Noir Triblend Markers. Once it was done I used the matching die to cut the piece out. I trimmed down some Neenah and added a very light area of pink ink to the centre and stamped the sentiment. I also added some white gel pen detailing to the flowers for added extra. I picked out some colored card and patterned paper from my stash and trimmed them all down so that they would leave borders around the edges. I then set about assembling the card and added some Majestic sequins to finish it card off and add some sparkle. This is a beautiful stamp to color and I love how it turned out. Erum here today with a one layer floral card! For my card today, I have used the Lovely Blooms Stamp Set. And today I used alcohol markers to colour my image. I started by stamping the image with alcohol marker proof ink and I also did a bit of masking to add more leaves. This made the image a lot more fuller. Next, I coloured the images and after that, I drew a black border to show as if it was behind the floral bouquet. I do this a lot just to ground my florals. To add a bit more interest, I used a graphite pencil, a normal writing pencil to add a bit of shadow to the floral image and then blended it out with a blending stump. To finish off, I stamped the sentiment from A Cup of Thanks Stamp Set. That is all for today. I hope you liked my card. Hello my friends, Ilda here! Today I have a Christmas card to share with you, done in a non-traditional Christmas color palette. I wanted to use the Poinsettia Trimmings Stamp set but wanted to have fun with coloring them in other than red. I am also participating in Kathy Raccosin’s 30 Day Coloring Challenge and used this as an opportunity to learn from my coloring. I’m sure this would card would have turned out beautifully as well done in a red and green Christmas palette, but this way you can see all how fun the poinsettias look done in a variety of colors. To make this card I began by stamping out the teacup from the Cup of Thanks set and masking off the top. I then removed the mask and did some partial stamping of the Poinsettia Trimmings stamp, by only inking the areas I wanted to stamp out and wiping off ink of any adjacent flowers before stamping out the image. Next, I used Copic Markers to color in the cup of poinsettias and then used the cup of thanks coordinating die to do a partial die cut of the cup. I then fussy cut the poinsettia area and the space in between the cup handle that I had drawn in to connect the lines that were missing. I then finished off the images by adding some silver detailing on the rim of the cup with a silver gelly roller pen and then added some silver crystals to the saucer. To the center of the poinsettias and berries, I added glossy accents. The background was made using the Halftone Dots Cover Die and gluing that piece onto Silver Glitter cardstock. The Silver embossed sentiment strips come from both the Cup of Thanks and the Holiday Village Stamp sets. To complete the card, I adhered all the elements onto the card base using foam tape. I hope you enjoyed this Cup of Poinsettia Wishes Christmas Card. Thank you all for stopping by and until next time… Happy Crafting! Good morning, Studio Katia friends! 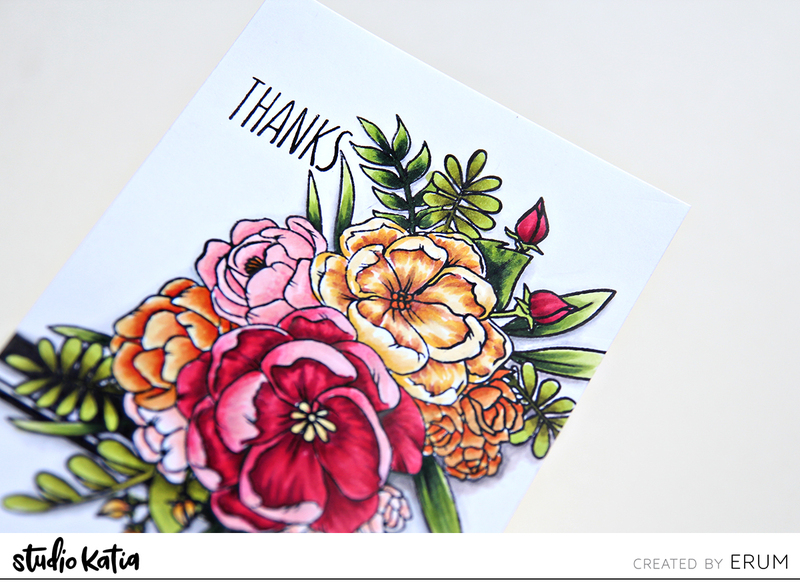 Rubeena here with a simple card using lots of florals from the set, Floral Trimmings. What I love about this set is how versatile it is. It includes many images that would be perfect for border stamping, masking and covering a card base to mimic a “background stamp” or using each stamp on its own. Since this is my first time using the set, I decided to keep it simple. I stamped one of the images on each side of a sheet of white cardstock. I colored the flowers and leaves with alcohol ink markers. I added some details with a white gel pen for highlights. I thought the sentiment “thank you” and “so much” from Thank You So Much would be perfect. I stamped it in the center with black pigment ink and heat-embossed with clear embossing ink for added effect. I trimmed down on the sides and mounted the panel over a black folded cardbase. I finished it off with some Iridescent Gems. Hi there! It’s Natalia here. I want to share with you my card using You’re So Sweet stamp set. First I stamped the cute image from the Whismical Town and beautiful flowers from You’re So Sweet stamp sets. Colored with copic markers and die cut them with coordinating dies. I blended some distress inks onto white piece of paper. Another piece of glitter cardstock I die cut using Dotted Patterns Simple Borders dies. I foam mounted all the elements onto white paper panel and heat embossed the sentiment from You’re so Sweet stamp set using white embossing powder. Decorated everything with Clear Drops Mix One.